If you're looking to flesh out your phone with some high-tech audio, Best Buy has two options at a significant discount today. The JayBird BlueBuds X is a highly-recommended pair of Bluetooth headphones that includes workout-friendly water resistance and an integrated microphone and music controls. 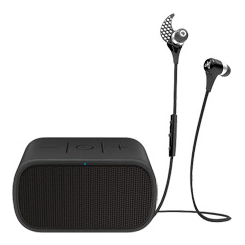 The Ultimate Ears Mini Boom is a great little Bluetooth speaker. Right now you can pick them up in a bundle for $169.98, a hundred bucks cheaper than the combined retail price. As it happens, Android Police has reviewed both of these products, and each one gets a hearty recommendation. The BlueBuds X are Artem's personal favorite Bluetooth headphones (seriously, he carries them everywhere), justifying their premium $170 price with a solid one-piece design, great battery life, and the ability to charge from any MicroUSB cable. Cameron says that the Mini Boom speaker's loud volume, "double up" stereo capability, and NFC pairing make it well worth the $99 MSRP. 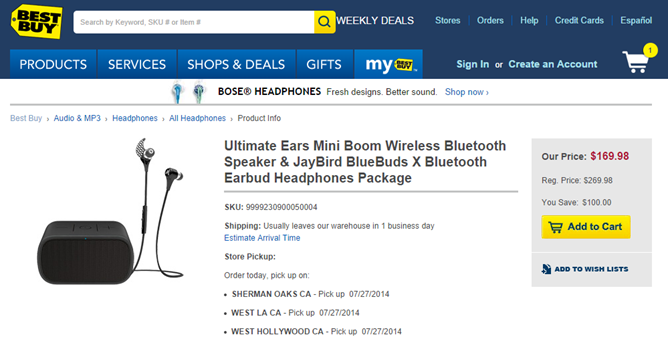 With Best Buy's discount, you could take the view that you're buying the headphones and getting the speaker for free. Shipping is free for online orders, and in-store pickup seems to be available at most of Best Buy's retail locations. Since they have stores in pretty much every state of the Union, I doubt you'll be able to avoid sales tax on this deal. If you want it, get an order in fast - the price will probably only last for today.